The new generation of jailbreaks has arrived for iPhones and iPads running iOS 12. Rootless jailbreaks offer experts the same low-level access to the file system as classic jailbreaks – but without their drawbacks. We’ve been closely watching the development of rootless jailbreaks, and developed full physical acquisition support (including keychain decryption) for Apple devices running iOS 12.0 through 12.1.2. Learn how to install a rootless jailbreak and how to perform physical extraction with Elcomsoft iOS Forensic Toolkit. We’ve published numerous articles on iOS jailbreaks and their connection to physical acquisition. Elcomsoft iOS Forensic Toolkit relies on public jailbreaks to gain access to the device’s file system, circumvent iOS security measures and access device secrets allowing us to decrypt the entire content of the keychain including keychain items protected with the highest protection class. With more than 127 million users in multiple countries, Apple Pay is one of the more popular contactless payment systems. Unlike some competing payment technologies, Apple Pay is not only tightly integrated into Apple’s ecosystem but is exclusive to Apple devices. iPhone protection becomes tougher with each iteration. The passcode is extremely hard to break, and it’s just the first layer of defense. Even if the device is unlocked or if you know the passcode, it is not that easy and sometimes impossible to access all the data stored on the device. This includes, for example, conversations in Signal, one of the most secure messengers. Apple did a very good job as a privacy and security advocate. This is why we brought our attention to cloud acquisition. We pioneered iCloud backup extraction several years ago, and we are working hard to acquire more data from the cloud: from the standard categories available at www.icloud.com (such as contacts, notes, calendars, photos and more) to hidden records as call logs, Apple Maps places and routes, third-party application data stored on iCloud drive (not accessible by any other means), iCloud keychain (the real gem! ), and recently Messages (with iOS 11.4, they can be synced too). Cloud acquisition is not as easy as it sounds. First, you need the user’s credentials – Apple ID and password at very least, and often the second authentication factor. Additionally, for some categories (such as the keychain and messages), you’ll also need the passcode of one of the ‘trusted’ devices. But even having all of those, you will still face the undocumented iCloud protocols, encryption (usually based on well-known standard algorithms, but sometimes with custom modifications), different data storage formats, code obfuscation and hundreds of other issues. We learned how to fool Two-Factor Authentication and extract and the authentication tokens from desktops. We are playing “cat and mouse” with Apple while they are trying to lock iCloud accounts when detecting that our software is being used to access the data. We have to monitor Apple’s changes and updates almost 24/7, installing every single beta version of iOS. iCloud acquisition gives fantastic results. In most cases, you do not need the device itself (it may be lost or forgotten, or thousands miles away). You can obtain deleted data that is not stored on any physical device anymore. You can obtain tons of valuable evidence from all the devices connected to the account. But as always, there are some “buts”. Sorry for the long intro, and let’s proceed to what we have done about iPhone physical acquisition. This publication is somewhat unusual. ElcomSoft does not need an introduction as a forensic vendor. We routinely publish information on how to break into the phone, gain access to information and extract as much evidence as theoretically possible using hacks (jailbreaks) or little known but legitimate workarounds. We teach and train forensic experts on how to extract and decrypt information, how to download information from iCloud with or without the password, how to bypass two-factor authentication and how their iPhone falls your complete victim if you know its passcode. This time around we’ll be playing devil’s advocate. We’ll tell you how to defend your data and your Apple account if they have your iPhone and know your passcode. Numerous vendors advertise many types of solutions for extracting evidence from Android devices. The companies claim to support tens of thousands of models, creating the impression that most (if not all) Android devices can be successfully acquired using one method or another. On the other side of this coin is encryption. Each Google-certified Android device released with Android 6.0 or later must be fully encrypted by the time the user completes the initial setup. There is no user-accessible option to decrypt the device or to otherwise skip the encryption. While this Google’s policy initially caused concerns among the users and OEM’s, today the strategy paid out with the majority of Android handsets being already encrypted. So how do the suppliers of forensic software overcome encryption, and can they actually extract anything from an encrypted Android smartphone locked with an unknown passcode? We did our own research. Bear with us to find out! Many thanks to Oleg Davydov from Oxygen Forensics for his invaluable help and advise. We live in the era of mobile devices with full-disk encryption, dedicated security co-processors and multiple layers of security designed to prevent device exploitation. The recent generations of Apple mobile devices running iOS 10 and 11 are especially secure, effectively resisting experts’ efforts to extract evidence. Yet, several solutions are known to counter Apple’s security measures even in iOS 11 and even for the last-generation devices. 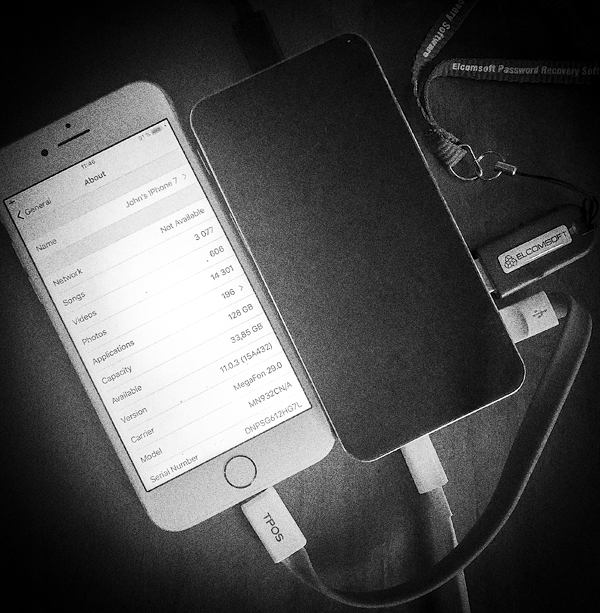 It is not surprising that Apple comes up with counter measures to restrict the effectiveness and usability of such methods, particularly by disabling USB data connection in iOS 11.4 after prolonged inactivity periods (well, in fact it is still in question whether this feature will be available in new iOS version or not; it seems it is not ready yet, and may be delayed till iOS 12). A new iOS update is about to roll out in the next few weeks or even days. Reading Apple documentation and researching developer betas, we discovered a major new security feature that is about to be released with iOS 11.4. The update will disable the Lightning port after 7 days since the device has been last unlocked. What is the meaning of this security measure, what reasons are behind, and what can be done about it? Let’s have a closer look.